(Note: This is part 1 of a 2-part series.) Picture this… A large national laboratory had just finished fabricating a special magnet system, but there was a lot of debris remaining after the process. This particular lab was circulating deionized water (also known as “DI water”) through the new system, but prior to start-up, the water needed to be filtered and recirculated until the system was clean. This situation actually happened to one of our customers. If it were you, how might you have resolved this sensitive issue? The system had a high differential pressure of 70 PSI and a flow of 10-GPM to 15-GPM, so we actually needed to incorporate a custom stainless-steel pump in order to meet their flow and pressure requirements. Since DI water corrodes most metals, many of their standard components also had to be upgraded to stainless steel or a suitable plastic polymer. So what made this situation any different than other filter cart application? This one was unique because the laboratory required the addition of an special compressor to purge the DI water from the system after it was purified. We knew the volume of the system and the pressure that needed to be overcome, so we decided that it was best to use a 5-gallon air tank to have enough air at the system’s disposal. 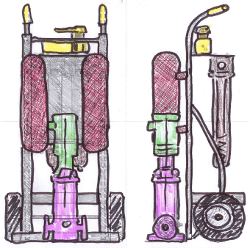 In order to finish the job well, we ended up developing a full-scale custom filter cart that included an on-board compressor, which was needed to force air behind the deionized water and thus push it out of the vein in the magnet. The engineering sketch (click for full size) that you see with this article is the initial drawing that we devised. But we’re not done yet. What trials and tribulations may we encounter at start-up? Will the laboratory see successful results once all the kinks are worked out? Stay tuned to reading Part 2.